Cerebral palsy is the leading cause of childhood disability in the United States, affecting 1 out every 323 children living in America. It would be a mistake, however, to consider the neuromuscular disorder a single disease. In fact, cerebral palsy (CP) refers to a family of related conditions, all stemming from injuries to or congenital malformations in the brain. Whether caused by an injury during delivery or genetic mutations early in fetal development, cerebral palsy disorders impact the way a person moves and maintains balance. In a very real sense, cerebral palsy affects each patient differently, not only because brain damage’s observable manifestations vary from person to person. Many patients, if not most, will also be diagnosed with co-occuring disabilities. Some conditions, like the motor speech disorder dysarthria, are considered secondary to cerebral palsy, because they only develop due to a child’s primary neuromuscular disorder. Associative conditions, on the other hand, don’t seem to be related to the patient’s primary disorder, but appear nonetheless to occur more frequently in people with cerebral palsy. Severe visual impairments are one example, affecting around 10% of all cerebral palsy patients. Between 70% and 80% of patients will be diagnosed with spastic forms of cerebral palsy, the Centers for Disease Control & Prevention reports. 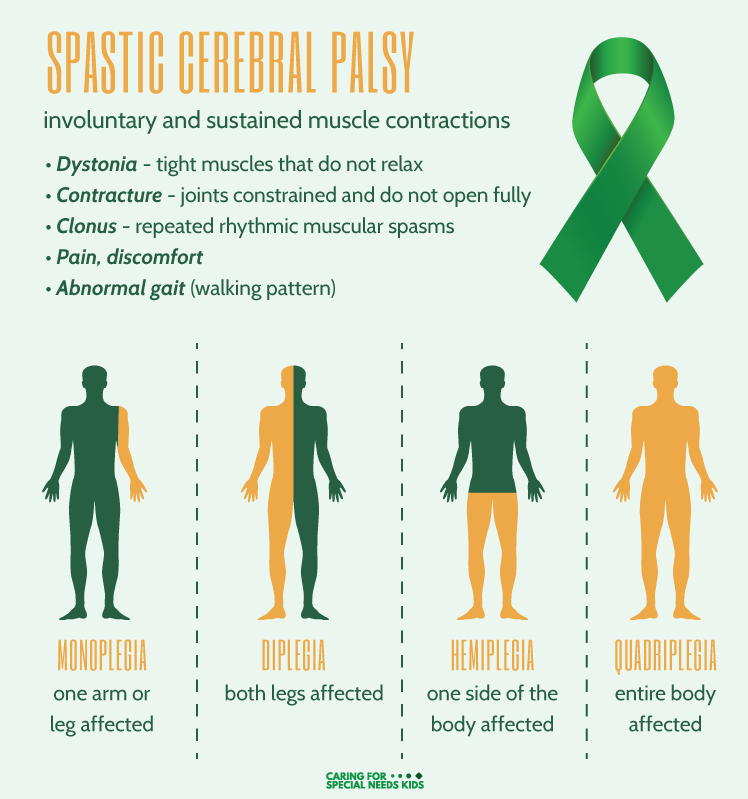 As the name suggests, spastic cerebral palsy is characterized by spasticity, but the word here isn’t being used in its colloquial sense. In medical terms, spasticity refers to an involuntary (not conscious or intentional) increase in muscle tone. In most people, muscle tone is regulated by a delicate play of neural messages from the brain, allowing muscles throughout the body to maintain or change posture with relative ease. Throughout the day, the brain sends little signals through the central nervous system, telling muscles to relax. Likewise, muscles themselves are sending signals through the spinal cord, asking to contract. Movement, however, comes from the coordinated interplay of these neural messages. In order to change position smoothly, every joint in the human body must be influenced by two separate sets of muscles, one on either side of the joint. One set of muscles relaxes, releasing tension on one side of the joint, while the other set contracts, pulling the joint in the desired direction. In people with spastic cerebral palsy, this give-and-take is interrupted. Neural messages get scrambled as they pass through damaged portions of the brain. As a result, one half of the movement equation has been lost – namely, the signals that call for muscle relaxation, which originate in the brain. The muscles, meanwhile, are continually sending messages to contract, but there are no longer any complimentary signals to serve as a balance. This imbalance lead to an over-contraction of the muscles. Instead of relaxing on one side of a joint, while contracting on the other, the muscles on both sides contract simultaneously, giving movements a stiff or jerky appearance. In a global sense, spastic cerebral palsy can make many daily activities difficult, along with causing pain and disturbing a child’s sleep. While children with cerebral palsy aren’t affected by physical deformities as a matter of course, many patients will develop structural abnormalities due to their neuromuscular disabilities. Living with impaired muscle function can alter a child’s growth in major ways, leading to imbalanced muscle development, misaligned joints and bone malformations. These secondary effects of cerebral palsy can be joined by tertiary effects, according to Gillette Children’s Hospital – “coping responses” that a patient develops to offset the challenges presented by walking and moving. The increases in muscle tone associated with spastic cerebral palsy aren’t always limited to a patient’s arms and legs, especially in quadriplegic forms of the disorder. Spasticity can also come to alter how small groups of muscles, like those controlling the tongue or vocal cords. That’s why some children will also have trouble eating, drinking or speaking. Moreover, spastic-type symptoms need not occur in isolation. Many children with primarily spastic forms of cerebral palsy will also be affected by ataxic- and athetoid-type symptoms, which involve involuntary movements and coordination problems respectively. Why Does Spastic-Type CP Happen? Intracranial Hemorrhage – Bleeding inside the brain can place undue pressure on brain tissues, ultimately leading to cellular death. Any number of factors can result in intracranial hemorrhage among fetuses, including certain congenital blood disorders. Traumatic (ie blunt force) injuries sustained during labor or delivery can also lead to intracranial hemorrhage. Fetal stroke, which occurs when blood flow to the brain is cut off, has been associated with an increased risk for cerebral palsy as well, along with epilepsy disorders and intellectual disabilities. Hypoxic-Ischemic Encephalopathy – Many infants experience decreases in oxygen intake during delivery, sometimes simply due to the natural stresses of passing through the birth canal. In other cases, inexpert obstetric care interferes with the umbilical cord or otherwise obstructs the flow of air. No matter the exact cause, infants are only equipped to withstand brief episodes of neonatal asphyxia. Longer-term oxygen deprivation can literally starve the brain and lead to permanent tissue damage. A child’s individual diagnosis will be intimately tied to where their brain sustained injury or developed improperly. Note that things in the brain are somewhat reversed. The organ’s right side controls movement on the left side of the body, while the left side of the brain governs movement for the right. Thus, a child with diplegic cerebral palsy that affects muscles on the body’s right side will likely have sustained damage in the brain’s left hemisphere. Can We Treat Spastic Cerebral Palsy? The original brain damage that leads to spastic cerebral palsy is irreversible. Improving a child’s motor function, comfort and quality of life, however, is possible. Cerebral palsy is a radically complex disorder and treatments will vary widely from patient to patient, although most children begin with physical therapy. Spasticity, the condition of increased muscle tone, is often treated through the use of prescription medications. Structural problems that develop due to a child’s neuromuscular condition can often be helped through surgical intervention. Followed by rehabilitation therapy, these procedures can allow children to maximize their existing abilities and discover new ways to overcome their challenges.